Made with a photo of your choice, I will work with you to create a lasting memory in a beautiful glass pendant . This unique piece of jewelry makes a great gift for someone who has just had a new addition to their family. Or perhaps a memory for a lost pet. A wearable work of art that can be enjoyed for years to come! What a wonderful keepsake! After checkout, please email a high resolution digital copy of your photo to alckathyc@juno.com. Remember to refer to your order and give me your name and address and a phone number in case I have questions or problems. If you don’t have a good digital image, try to scan it and send me the .jpg file. Or contact me to send me a photograph, minimum size 4 X 6, and I will scan it. It will be returned with your order. 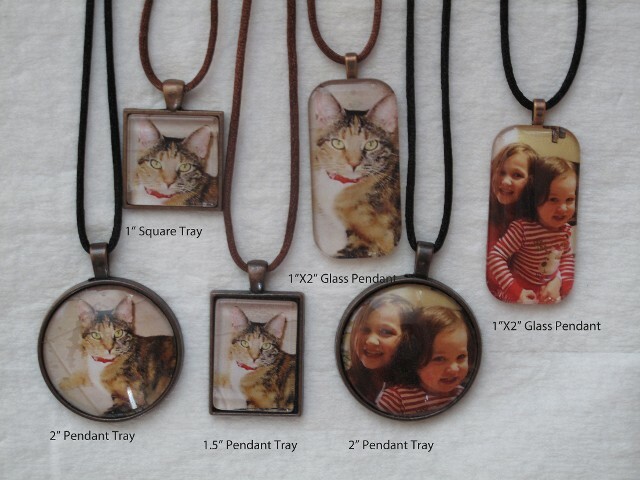 Your photo will be sized to fit in the pendant and will then be preserved under glass and inside a pendant tray OR under the clear glass pendant and sealed with hand poured resin on the backside. Even though it is water resistant, I do not recommend wearing in the shower or while swimming. PLEASE NOTE: Unframed 1" X 2" glass pendant is not suitable for the key chain clasp. Please only order the 24" Antique Chain for this option. I am having trouble getting my paypal buttons to work on this website. If the button does not work, please contact me at butterflykissesstudio@yahoo.com or call (352) 241-6407 and I can take your credit card over the phone.